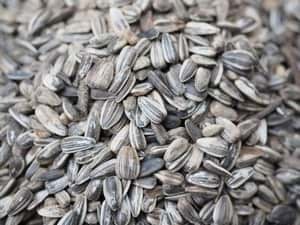 Sunflower seeds are the fruit of the sunflower. They are usually classified by the pattern on their shell. Black oil sunflower seeds are usually pressed to extract their oil. Striped sunflower seeds are primarily eaten as a snack. Do Ducks Eat Sunflower Seeds? Ducks can eat both black oil and striped sunflower seeds and it doesn’t matter if they still have their shells. When buying, just make sure to get ones that don’t have any salt added to them. If you’re looking to make your own homemade duck feed checkout following receipe which also includes sunflower seeds. Conclusion: you can feed ducks sunflowers seeds both in-shell or dehulled. Do you sometimes offer sunflower seeds to ducks? Let us know in the comment section below.